Named to KHOU-TV’s 11 Best Barbecue Restaurants! Houstonians know good barbecue when they taste it. That’s why it is no surprise that KHOU Channel 11 turned to Houston viewers to ask who has the best barbecue in the Houston area! And guess who made the list? We did! That’s why we want to graciously say thank you to everyone that helped us make the top 11! For nearly 25 years, Triple J’s Smokehouse has been bringing the heat with our unique take on Texas barbecue. Folks from all across the Houston area have come to our location in Northeast Houston to enjoy our renowned sausage, our out-of-this-world brisket, and our signature local favorites, like our Raven’s Bowl. Life is too short not to eat Triple J’s barbecue! Stop by our location on Homestead Road Tuesday through Saturday! Yes, we’re that excited for RodeoHouston. It’s less than a month away! Have you stopped by our booth at the rodeo? You haven’t? Well you need to change that! Find us in Kid Country area of the Rodeo Carnival at booth 501. We’re big and bold so you can’t miss us. But if you need a reference point, just remember we are not too far from the Stars Over Texas stage. We’re also proud to announce that we’ve been awarded yet another Foodie Value Award! Our second one! Thank you RodeoHouston! December 30, 2014 Thank You Houston For A Great 2014! All of us here at Triple J’s Smokehouse wants to thank Houston for another wonderful year. We would not be here without the wonderful support from all the Houstonians near and far that come to our little restaurant for Texas barbecue that is straight from the heart. We hope you keep coming back and here’s to a great 2015! We’re still going strong after 20 years and we’re going to keep rocking for another 20! Once again, thank you Houston! I hope you had a wonderful summer! But now it is time to get back to the most important thing on weekends besides spending time with your family: football — whether it is college or the NFL! We had a wonderful opening salvo to the college football season (Go A&M! Go UT! And we still love you Rice and UH! You’ll all have great seasons this year! ), and we were treated to a clinic by the defending Super Bowl Champions on the Thursday night NFL opener! Your Houston Texans (and your Dallas Cowboys, for all you local Cowboy fans) start up their seasons on Sunday and you better not forget to invite Triple J’s legendary barbecue to your party! We are Houston’s tailgating authority, and we got the specials and the food that will add a unique flair as you gather all your rowdy friends for Sunday afternoon, Sunday night, and Monday night (dun-dun-da-dun)! In all seriousness, thank you Houston for making us a part of your football tradition and whether you decide to tailgate at NRG Stadium or bring all your friends over in front of the big screen, you can count on Triple J’s Smokehouse to have the barbecue you and your friends will absolutely love. The restaurant business is tough — any culinary entrepreneur can attest to that. Many restaurants, some owned and operated by some of the most talented restaurateurs, have come and gone over the past two decades here in the Bayou City. That’s why we are amazed and we are grateful to still be here, serving our unique brand of barbeque to Houston natives, newcomers, and visitors alike, after 20 years. 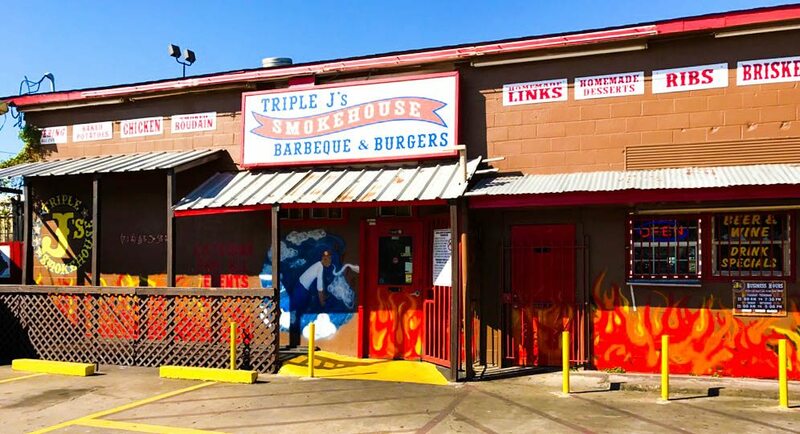 Triple J’s Smokehouse opened November 1994 at the corner of Lockwood and Kelley in Northeast Houston. Our initial establishment was small — only just room for a drive thru, walk-ups, and a cooking and preparation area. We soon became a Northeast Houston staple and our popularity and notoriety for having Houston’s most unique and flavorful barbeque began to spread. We started selling barbecue at the Houston Livestock Show and Rodeo in 1998. By the mid-to-late 2000s, we were doing catering for the Houston Texans and other NFL teams, Habitat for Humanity, Beyonce Knowles, the University of Houston, Shell Oil, among others. During that time, we also participated in the 2004 NFL Tailgate BBQ Cookoff during Super Bowl XXXVIII. Like any establishment in our industry, we’ve had our ups and downs. But what kept us going was our desire to serve you, the Houston faithful, with the barbeque that you came to love and kept coming back for. We moved to our current location on Homestead in 2005 after three years of being a catering-only business. We have experienced a tremendous amount of success since then, and we hope that we can continue that success for years to come. However, most importantly, all of us at Triple J’s want to thank you, the wonderful customers that come in day in and day out, year after year, for our flavorful ribs, tender brisket, our loaded potatoes and more. Each and every one of you has made the past 20 years special to us, and we hope you keep coming back to us for the next 20 years and then some. Join us as we celebrate 20 years this year…you never know, we just may end up doing something special for the month of November. We’re just getting started and we’re not going anywhere. May God bless each and every one of you, and from the bottom of our hearts, we say, thank you. Even when you thought everything was grim! Seem like a real star! We tried! Nonetheless, this just a friendly reminder to bring your meat to Triple J’s Smokehouse this holiday season where we will cook your meat for you to tender tasty goodness that will make everyone around the table smile. Please call us for more information! It has been another fantastic year at Triple J’s Smokehouse, and we want to extend our warm, heartfelt thanks to each and every one of our customers and their families who made us their choice for lunch or dinner! We are proud to be a part of the Northeast Houston community and we desire to continue doing so for years to come! The holiday season is a time where a lot of us reflect on family and at Triple J’s, we consider each and every one of you that comes in to our restaurant a part of our family. We always love seeing familiar faces – and meeting new ones too! And day in and day out we promise to take care of our family by preparing the best barbecue dishes in Houston! Even though things might be a little bit chilly (okay… very chilly) around here in The Bayou City, the kitchen is always red hot at Triple J’s, where we are cooking up the best ribs, sausage, brisket, chicken, and potatoes that have made us a Houston barbecue favorite for nearly two decades. And as you already know, during this time of year, we kick it up another degree with by offering to prepare your turkey for your family’s Christmas feast. What’s the difference between a Triple J’s fried or baked turkey compared to one from another restaurant? A turkey that is treated with the culinary flare of Triple J’s has our restaurant’s renowned signature flavor and quality that you cannot get anywhere else. Always remember Houston — no Christmas dinner is complete without the lively flavor from Triple J’s Smokehouse! Call us today to arrange for your turkey to be fried or baked by our wonderful staff! Interested in bringing other meats for us to prepare for you? Let us know! The kitchen is hot, the oven is hot, the deep fryer is hot, and we’re cooking up a (winter) storm here at Triple J’s!